Refinery Flocks is the resulting project of the previous Refinery Flock (2006), Refinery Again (2008). It comprises a selection of the photographs of both projects plus some new photographs taken in late 2009. Nature is able to adapt. Recently, for instance, great catastrophes, as petrol spills in the sea, did not produce, in some cases, all the predicted effects thanks to the extraordinary resilience of ecological systems. Our planet evolution, even if only in the last century heavy marked by the so called “industrial progress”, always showed an exceptional adaptation to changes. 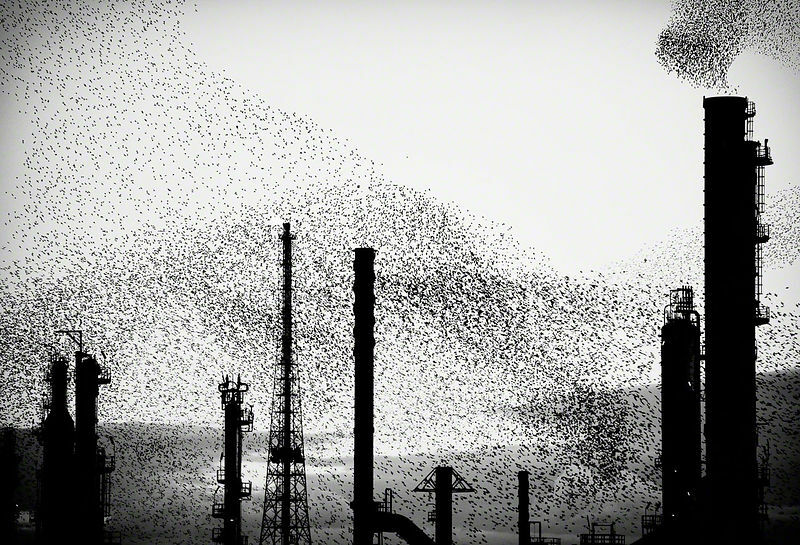 heat emitted by a Refinery, would like to investigate these “symbiotic” aspects, these precarious equilibria between industries and animals, between men made artifacts and Nature. Not with the common idea of represent how horrible are humans creations, but aiming at highlighting possible and strange harmonies.